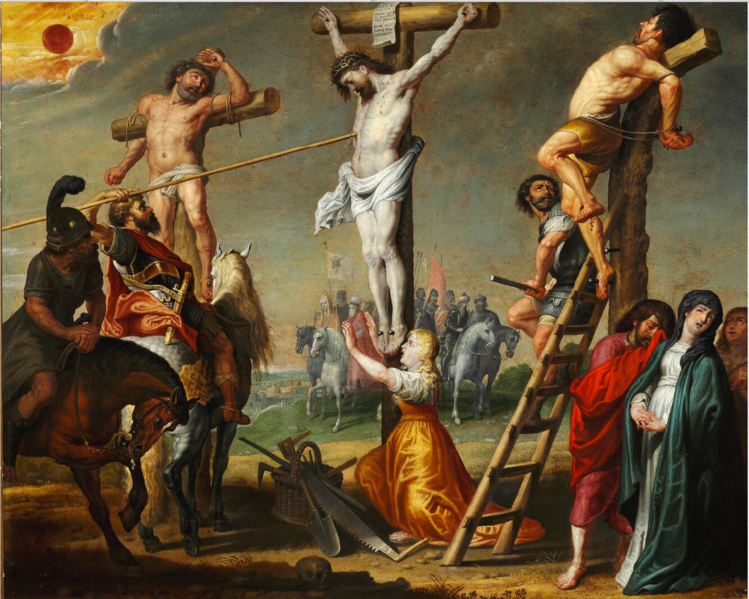 Credit: Gerard de la Vallée, “Longinus piercing Christ’s side with a spear,” 17th cent. This Friday, Christians around the world will commemorate the death of Jesus Christ. At the church where I serve, we will hold services centering around the traditional seven final phrases that Jesus speaks from the cross. Many of these phrases are extraordinarily well-regarded and famous. For instance, when Jesus prays for His executioners, saying, “Father, forgive them, for they do not know what they are doing” (Luke 23:34), we are treated to a tour de force in what true forgiveness looks like. When Jesus cries out, “My God, My God, why have You forsaken Me?” (Mark 15:34) we hear in His words both an ache for God’s presence in suffering as well as a separation from God because of sin. This hardly seems like a profound statement. It seems more like a mundane request. A man who is baking in the hot ancient Near Eastern sun while hanging exposed on a cross has developed a case of cotton mouth. And yet, these words represent not only the cry of a parched mouth, but the yearning of a scorched soul. The Psalmist describes his desperate thirst for God. And how does God respond to his thirst? God not only gives the Psalmist’s soul spiritual water, He offers the Psalmist a superabundance of this water in the form of waves and breakers. But this takes us back to Jesus’ words from the cross. For when Jesus, who offers all men refreshment for their souls, Himself complains of thirst, how do men respond to Him? God responds to human thirst with refreshing water. Humans respond to God’s thirst with bitter vinegar. What a contrast. The water of life stubbornly remains, flowing from the side of the One who died. This week, as we reflect on and remember Jesus’ death, may we drink deeply from the water of His life. For the water of His life gives us eternal life.